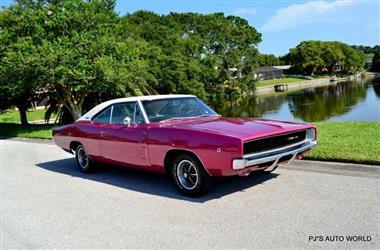 1968 Dodge Charger in Clearwater, FL for sale. 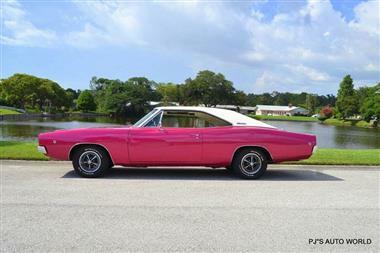 1968 Dodge Charger 383 for Sale. 383 CID V8 engine, 727 automatic transmission, A/C, power steering, front power disc brakes, 8 3/4 rear end, 14� Magnum 500 Wheels with BF Goodrich Radial T/A tires, custom Raspberry Metallic exterior, white vinyl top, vacuum operated hideaway headlights, drivers remote mirror, power windows, custom white bucket seat interior, wood trim steering wheel, upgraded AM/FM/Cassette radio, key-less remote power door locks. 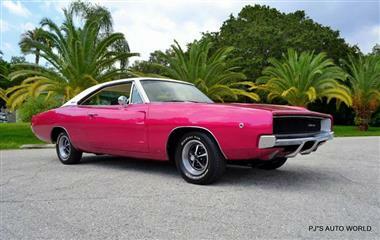 The 1968 Charger is a timeless Classic that only seems to get more valuable by the day. 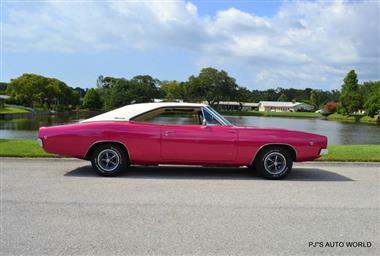 This beautiful Big Block Mopar runs and drives great and is sure to make its next owner proud! 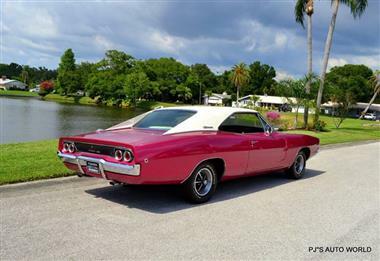 Automotive History: The entire B-body lineup for the 1968 model year was redesigned and the Charger was further differentiated from the Dodge Coronet models. The first generations efforts to look somewhat posh were abandoned in favor of designer Richard Sias double-diamond coke bottle profile, with curves around the front fenders and rear quarter panels. Front and rear end sheet metal was designed by Harvey J. Winn. The rear end featured a kick up spoiler appearance, inspired by Group 7 racing vehicles. 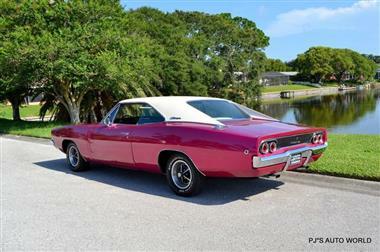 The fastback roof was gone, in favor of a flying buttress similar to that of the 1966-67 Pontiac GTO. 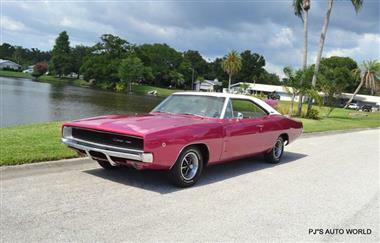 The Charger retained its full-width hidden headlight grille, but a vacuum operated cover replaced the electric motor rotating headlights. The previous full-width taillights were replaced with dual circular units at the direction of Styling Vice President, Elwood P. Engel. Dual scallops were added to the doors and hood. The 1968 film Bullitt helped popularize the Dodge Charger for its notable car chase alongside the titular characters 1968 Ford Mustang GT through the streets of San Francisco California, which has been regarded as one of the most influential car chase scenes in movie history. 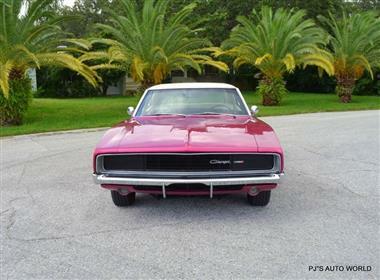 The 1968 model year Charger sales increased to 96,100.